A two wheeler insurance policy covers you financially against damages to your bike or scooter and injuries sustained by you due to unforeseen events such as accidents, thefts or natural disasters. Bike insurance policies also cover you against financial liabilities arising out of injuries or damages caused to third-parties in an accident. The costs involved can make a major dent in your finances. Two wheeler insurance policies provide financial protection against such setbacks. While two wheelers offer convenience, comfort and freedom, they are also one of the most unsafe modes of transport, accounting for a majority of the accidents and fatalities on the road. Accidents can wreck your asset and injure you or cause injuries to others on the road, potentially leading to huge financial losses. It is, therefore, important to protect yourself and your asset. Two wheeler insurance does just that. Bajaj Allianz's comprehensive two wheeler insurance policy provides coverage in both the scenarios. Online purchase and renewal: You can buy two wheeler insurance online in just a few clicks - it's that easy and convenient. The same applies for insurance renewal as well. 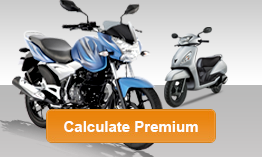 You can get instant two wheeler insurance quotes without any paperwork. Transfer of No Claim Bonus: You can transfer up to 50% of your No Claim Bonus (NCB) from any bike insurance provider. The NCB is a reward from an insurance provider for not making a claim on your policy. When you switch to Bajaj Allianz, you can migrate the No Claims Bonus from your previous policy to your new one. Instant support: Enjoy round-the-clock claims assistance and quick SMS updates on claims status through our call centres. Quick claims settlement: Enjoy speedy, hassle-free and cashless claims settlement through our network of preferred garages across India. Our processes are designed to minimize turnaround time on your claims. Hassle-free renewal: Even if your policy has expired, no inspection is needed if you renew it online. Loss or damage due to natural calamities: Your bike insurance policy covers fire, explosion, self-ignition or lightning, earthquake, flood, typhoon, hurricane, storm, tempest, inundation, cyclone, hailstorm, frost, landslide and rockslide. Loss or damage due to man-made calamities: Natural calamities aside, man-made disasters can also strike for a myriad of reasons. And these can be just as unforeseeable as natural disasters. The motorbike insurance policy from Bajaj Allianz provides coverage against burglary, theft, riot, strike, malicious act, accident by external means or any terrorist activity. Further, any damage in transit via rail, road, inland waterway, lift, elevator or air is also covered by the insurance policy. Personal Accident Cover: The bike insurance policy comes with a personal accident cover of Rs. 1 lakh for the owner or driver. It covers accidents that may occur while driving the vehicle, travelling on it and mounting or dismounting from it. You can also add personal accident cover for a pillion rider with this policy. Third Party Legal Liability: Bajaj Allianz two wheeler insurance covers liability to third parties. This covers any damage, loss, death or bodily harm caused to another person or property by the insured vehicle. This is mandatory as per the law in India. Bajaj Allianz offers a wide range of plans to cater to the diverse needs of vehicle owners. *Customers can also opt for 2 years long term policy. Getting insurance for your bike or scooter is now easier than ever! You can apply for a Bajaj Allianz two wheeler insurance online in just a few clicks. Buy or renew your insurance from the comfort of your home anytime, anywhere. 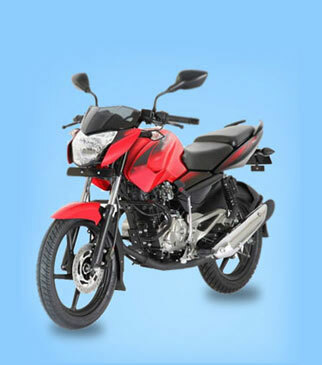 Online two wheeler insurance is convenient, quick and hassle-free! Normal wear and tear and general ageing of the vehicle. These are natural progressions that ultimately affect all vehicles. Theft or burglary of bike accessories, unless the vehicle is stolen at the same time. Wear and tear of consumables like tyres and tubes. However, if the vehicle is damaged at the same time as these items, then you can claim insurance. In such a scenario, the company shall be liable for only up to 50% of the replacement cost. When you have been through an accident, the last thing you want is to get involved in a lot of paperwork to claim your insurance. That is why Bajaj Allianz has made its bike insurance claims processes simple and efficient. From cashless settlement to phone assistance, making a claim is now completely hassle-free. You can make a claim in four simple steps. Motor On The Spot (Motor OTS) is a mobile based motor insurance claim settlement service which empowers you to file claims upto Rs.10,000/-. You can self-inspect your two wheeler and receive the claim amount in your account in 20 minutes after filling all the necessary details through our mobile app - Insurance Wallet. If the loss is not so severe, we suggest that you avail the spot settlement of Two wheeler Insurance claims through Bajaj Allianz Motor OTS. Very user friendly, easy to use and quick response on CHAT and completed the online process while chatting. I tried Bajaj Allianz General Insurance's Two Wheeler insurance for the first time and I must say its so easy and quick. You guys really are one of the best in the market. Thanks Bajaj Allianz General insurance for simplifying insurance for me. the staff is compassionate and helpful towards clarifying our doubts. Congratulations to the online staff members and the CEO for having such an awesome team. 1. What is Insured Declared Value or IDV in two-wheeler insurance and why is it important? IDV is the Insured Declared Value. When purchasing two wheeler insurance, your vehicle's market value at the time is taken into account. This value is referred to as the IDV. It helps in determining the sum against which your vehicle will be insured. 2. Is it possible to renew bike insurance online? Yes, it is possible to renew your bike or two wheeler insurance online. The process is very simple - visit our website and provide the details of your previous policy. The entire process can be done within minutes. 3. What is the full form of NCB and what does it mean? NCB stands for No Claim Bonus. If you make no claim during a policy period, you will be rewarded with a discount on premium during renewal. 4. How do I claim insurance for my bike or two wheeler? Register your claim - This can be done online through our website, or offline, over the phone. Submit your documents for verification - Once the damage assessment is made, you can submit the documents as proof of the damages. We will then settle your claim accordingly. 5. What are the benefits of a long-term policy? Protection from third party premium rate hikes and service taxes which occur almost every year. Added NCB benefit No Claim Bonus will not be cut down to nil if you make a claim during the policy period. It will be lowered, but it will still remain. Proportional Refund You can get a proportional refund in case of cancellation of policy, even if you made a claim during the policy period. 6. How can I buy two wheeler insurance online? You can do this by visiting our website. Choose the policy period you want and fill out all the necessary details. Once this is done, simply choose your mode of payment. This can be done through either your credit card, debit card, net-banking, or even your digital wallet. 7. How can I renew my insurance policy? What documents do I need for that? 8. How much time does it take for my insurance policy copy to arrive? The hard copy of your two wheeler insurance will be sent to your address via courier. It usually takes up to 7-10 days to reach you. but, you will get a soft copy via email as soon as the payment is verified and the policy is issued. You can also find the policy document on our website's customer portal using your issuance number, Further, you can access your account through our Mobile App - Insurance Wallet, or get updates through our twitter page, using our #TweetInsurance service. 9. Can I transfer ownership of my policy to someone else? What is the procedure? Yes, you can transfer ownership of the Bajaj Allianz two-wheeler insurance policy to someone else, if you are transferring ownership of the insured vehicle to that person. You simply need to hand over the related documents to the new owner and inform the insurance company, as well as the RTO. However, you cannot transfer your NCB to the new owner. 10.What happens if my two wheeler insurance expires?